Roof trusses are supplied prefabricated and certified by your kit home builder. As a matter of fact most authorities demand certified framing to be delivered pre-built these days, so building roof trusses on site can make certifying them a trial. In most circumstances, they are supported by external walls, with the bottom chord sitting on the ribbon plate of the walls at the 'heal'. 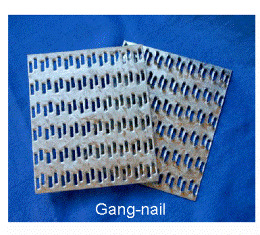 Modern roof framing is "gang nailed" for superior rigidity and strength. There are many types including 'common' or 'fink' trusses, 'howe', 'king' and 'queen' trusses. First thing to do is slide the trusses onto the wall frames (easier with two people), lay them evenly along the house framing ready to stand. 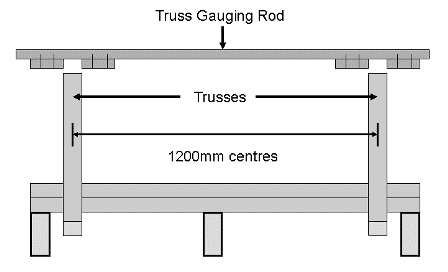 Fabricate a gauging rod to use as a template for truss spacing (1200mm/4ft). You can also set up a solid prop at the gable end to help with beginning the first truss and to tie off from. The first truss should start 90mm (3.5ins) from the gable end (on the inside of the ribbon plate edge) to make space for gable end studs, unless you are building an extended gable with eaves. Stand the first truss and nail it temporarily to the solid prop. Plumb the truss with a straight edge level until vertical, then secure it to the prop. Secure the truss at the heal (90mm from end) with cyclone ties. Stand another truss, use your gauging rod to find the 1200mm (4ft) centre, and temporarily nail a brace (a roof batten is good) across the two standing trusses. Plumb the second truss then nail off the temp brace securely. Check the centres with the gauging rod at the heals and install cyclone ties. Plumb each truss, brace and tie off as you go. The second last truss will probably be an extra to keep the centres standard maximum.